This year at NAB there are plenty of vendors, conferences and new gear to check out. As I walked the NAB Show floor, I stumbled upon the Intel booth. 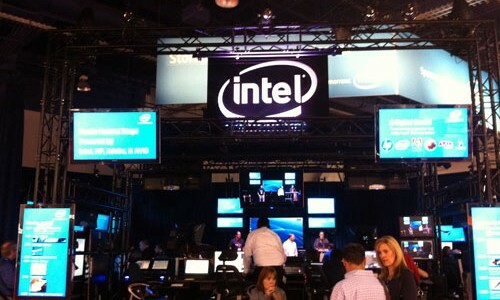 The Intel booth is simply one of the largest booth’s there. You don’t believe me? Just check out the picture below. Intel is on hand here at the NAB Show displaying some of there latest technology, while providing you with a place to sit and enjoy the band on stage, and check out various demos. At the booth there were many demos happing, one of which was their Thunderbolt technology, streaming at an unbelievable rate of 800mbs. Thunderbolt seems to be taking off as many of the manufactures her at NAB are displaying their latest gear touting this fantastic new technology. Intel was displaying their next generation dual port ethernet controller. The card codenamed “Twinville” supports. Low-cost cables up to 10 meters and backwards compatibility. Industry leading virtualization and storage over Ethernet features.